Linking over 4,500 exhibitors to some 140,000 visitors worldwide, the biannual Automechanika Frankfurt was held this year on September 16 to 20. As an important exhibition for the global automotive industry, the event attracted a strong turnout by Taiwanese suppliers seeking to build their businesses and connections with global buyers in the sector. More than 470 Taiwanese exhibitors were present at the show, mostly at Hall 4 and Hall 9. They showed their best products and highlighted unique core competencies with a shared aim to boost their images as trustworthy and competent partners that can help customers grow. About 230 of the Taiwanese exhibitors joined the group organized by CENS, making it the largest delegation sent from the island. The exhibitors included such globally known firms as Depo Auto Parts Industrial Co., Ltd., along with a large number of suppliers with decades of experience and strong growth potential. 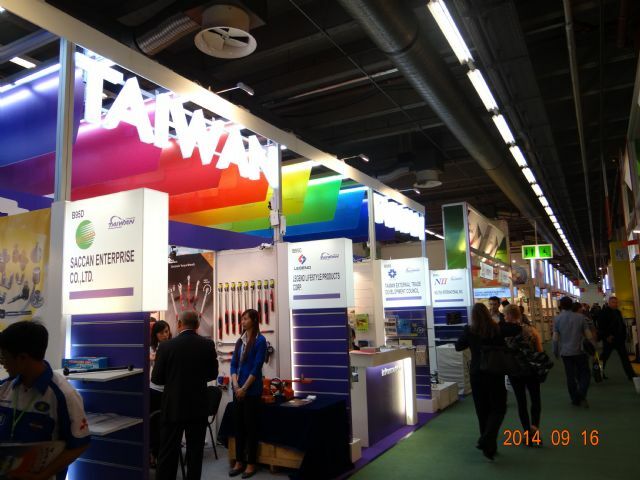 Taiwanese exhibitors of auto parts and components are mostly located in Hall 4.2 at the Automechanika Frankfurt 2014. Having been named as one of Taiwan's top 20 international branded suppliers since 2005, Depo was absolutely the most impressive exhibitor in the group. The firm didn't display many products at its booth, but still received a continuous stream of buyers. Depo global sales manager Michael Hu attributed the strong buyer interest to Depo's success in marketing its products to over 190 countries over the past decade. "This has given us ample brand exposure and recognition in the global market, particularly in the aftermarket segment," he said. While Depo has been a leading supplier in the global segment for aftermarket replacement headlights, shipments of original equipment (OE) products to North America have steadily surged over the years, partly thanks to sustained efforts to boost brand awareness and partly to product certifications, Hu said. Those factors, along with steady economic recovery in the region, have encouraged more local insurers to adopt the company's products to build inventories for claim settlements, he said. Depo has certainly raised its profile over its competitors in the sector of automotive headlights. Doing so, has not, however, been the path of least resistance. Hu said that Depo has spent heavily on strengthening its R&D capability, enhancing production capacity, broadening product range and establishing distribution channels to stay ahead of rivals. Citing LED headlamps and daytime running lamps, Hu emphasized, "Depo not only invests heavily in technology research to develop those products, but also pays attention to every detail in the production process to make them better than competitors." The manager exemplified this strategy noting that, "A headlamp calls for four different molds to produce, and is subject to different standards and specifications in America and Europe. Today Depo is capable of supplying headlamps for over 70% of car models on market. This shows how much Depo has invested in molds to achieve approved quality, not to mention other investments in R&D and daily operations." 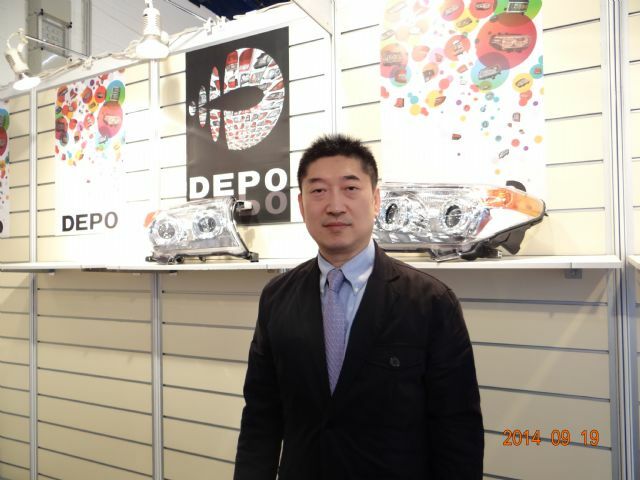 Depo global sales manager Michael Hu says the firm will focus equally on the AM, OEM, OES and ODM segments of the automotive headlights market in the short term. While leading the segments for aftermarket replacement LED lamps and daytime running lamps, Depo is now Taiwan's only automotive headlight supplier capable of supplying adaptive headlight systems, stressed Hu, suggesting the firm has spared no effort to boost its industry-leading image. Hu concluded saying, "Depo's current success is built on its dedication to quality, product range and branding, and good quality is a synonym for our brand name." He added that while staying focused on branding, the firm will also step up development of aftermarket, original equipment manufacturing (OEM), original equipment service (OES) and original design manufacturing (ODM) operations in the short term. Also at Hall 4.2, Kyo Wa Racing Co., Ltd., a specialized maker of aluminum alloy wheels, showcased a new series of wheels with attractive, stylish finishing achieved through CNC milling, engraving and other advanced processing techniques. The company aimed to impress buyers with its consummate production skills and market-driven R&D capability. Bruce Wu, a company sales representative, was among the Taiwanese exhibitors who felt sluggish buyer demand at this year's Automechanika Frankfurt. He attributed the inertia to the revelations that local buyers tend to wait and see if the EU will continue imposing anti-dumping penalties on some auto parts and components imported from China this year. "If the penalties continue, I believe European buyers will mostly turn to Taiwanese suppliers in the short term. Therefore, the innovations we are demonstrating here will help Kyo Wa to ride on the upcoming boom, which is particularly needed to stimulate buyers' slack demand." The abovementioned new wheel series attracted attention for their specially processed surfaces and impressive, vividly colored patterns composed of either numerous small dents or bigger-sized depressions. Wu emphasized that this is a product of Kyo Wa's decades-long experience in manufacturing and consummate craftsmanship. 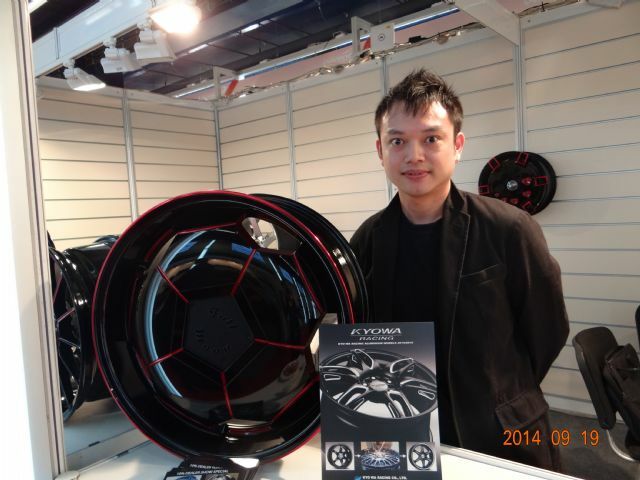 "To achieve those tattoo-like features, each wheel undergoes further three-axis CNC machining after casting," said Wu. "The process requires expert skill to ensure the wheel's structural strength isn't compromised." Kyo Wa sales representative Bruce Wu introduces the firm's new series of wheels aimed at demand for personalization among car lovers. Wu said that the wheel series presents not just Kyo Wa's ample manufacturing skills and experience, but also its market-driven R&D capability, primarily because the value-added, fashionable exterior designs meet the trend for greater personalization among car lovers. In that sense, Wu said, "Our products are intended to catch customer attention and drive sales." With strong commitment to innovation and superior manufacturing techniques, Wu emphasized, "Kyo Wa aspires to create new designs that can help clients boost their sales. This has earned us a solid reputation among foreign buyers over the years." Man Zai Industrial Co., Ltd. highlighted its core competency of offering consistent quality, stable delivery and value-added services to global buyers at the show with a display of high-quality radiators, condensers and evaporators. 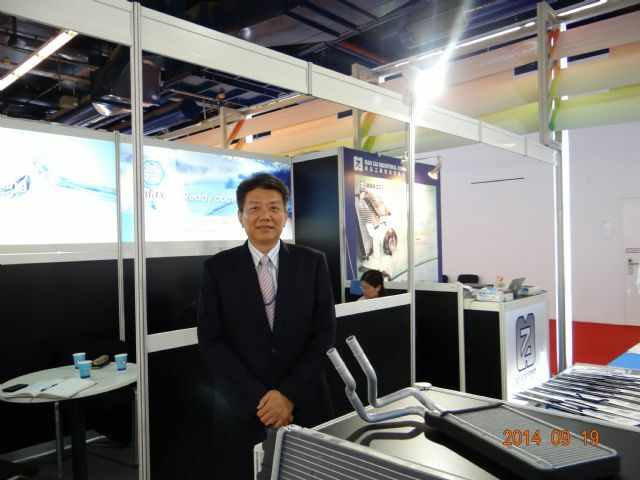 Man Zai chairman Justin C. Wan also observed weak buyer demand for auto parts and components at the exhibition. Undeterred, he emphasized that, for many exhibitors, maintaining relations with existing customers and exchanging new information have gained in importance, relative to finding new customers. "I think exhibitors should focus more on showcasing their core competencies and image, while highlighting how they can generate mutual benefits for themselves and their customers," said Wan. Wan indicated that Man Zai looked forward to impressing visitors with its decades-long experience and capabilities in making radiators, condensers and evaporators with top-caliber quality and punctual delivery. He noted that the company's operations, from production to quality control, have been ISO-9001 and TS16949 certified. Wan stressed that Man Zai has supplied products, mostly for commercial vehicles, to the aftermarket segment in both the U.S. and Europe for some decades. It has extensive experience in cooperating with customers on joint development of new products and markets, consolidating its reputation in the line. Despite the less-than-rosy market conditions prevailing at this time, Wan remains confident. He explained that the rise of electric vehicles is sustaining the sector for cooling system parts and components, which in turn has lent considerable growth momentum to his company. "Decades of devotion to cooling system parts strongly position Man Zai to meet the growing demand," he added. "Furthermore, Man Zai's competitive advantages are based on consistent quality, on-time delivery, flexibility pricing and value-added services." With consummate expertise in electrical parts and ignition modules, Fair Sun Industrial Co., Ltd. showcased a variety of exhibits with standard and customized specifications to show off its capabilities for developing and manufacturing both OE and aftermarket replacement electrical parts. Lourdes Chiu, company vice president, said that Fair Sun was founded in 1979 as a supplier of aftermarket parts and ventured into the OE segment in 2003, when it decided to tap GM's supply chain. The TS16949-approved company spent less than one year passing all certifications to become part of the U.S. automaker's supply chain, demonstrating the company's world-caliber manufacturing and quality control capabilities. Fair Sun vice president Lourdes Chiu says her company has been increasingly recognized as a reliable partner among U.S. buyers over the past two years. That decision has brought windfalls for Fair Sun. The company has been increasingly recognized among U.S. customers, and shipments have surged over the past two years. "Fair Sun is continually developing new products in cooperation with local customers. This drove robust growth during the first half of this year," the vice president said. "The image crafted from those customer-oriented R&D projects is vital to Fair Sun's continued competitiveness. 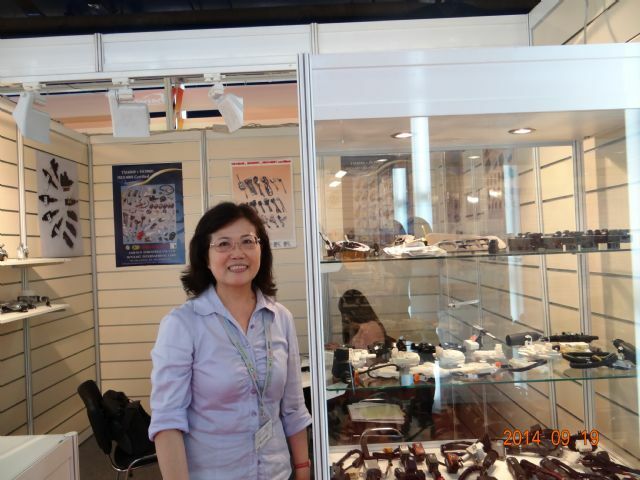 It also helped us to attract potential buyers at the show." In addition to its solid name as a competent R&D partner, Chiu attributed Fair Sun's survival amidst growing rivalry from emerging countries to its ability to provide services that customers can use to generate more profits in the increasingly challenging market. "Fair Sun will continue working with automakers on developing OE parts, while strengthening its capabilities and image in the aftermarket segment in order to develop sustainably," she said. 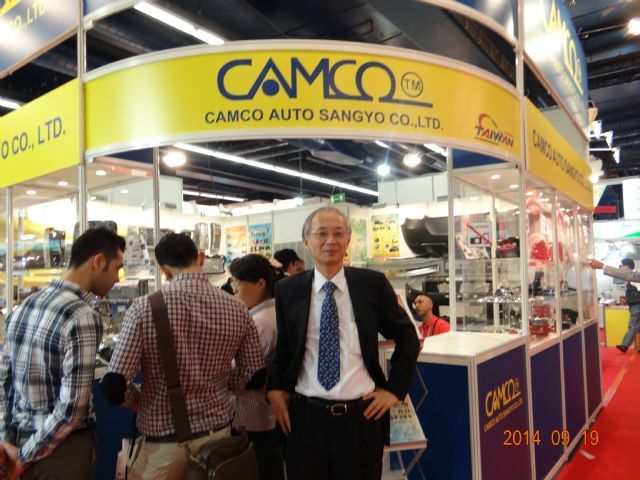 Camco Auto Sangyo Co., Ltd. presented a comprehensive product lineup at the show to highlight its ability to meet the growing demand for one-stop shopping services. The lineup included mufflers, absorbers, racing accessories, strut bars, steering wheels, lamps, mirrors, filters, wipers, grilles, gauges, brake rotors, wheel spacers, brake pads, spoilers, LED tips, carbon fiber intake system parts, short intake manifolds, inter coolers, and many other items that attracted close attention from visitors interested in made-in-Taiwan products. Bruce Liu, the firm's president, attributed the weaker demand at the show primarily to the nascent stage of Europe's economic recovery, reasoning that market demand still needs time to regain momentum. "Steady investment in exhibiting to enhance images among potential buyers is definitely necessary for Taiwanese suppliers to get through the current tough times," said Liu. He added that Camco has taken part in Automechanika Frankfurt for eight years in a row, with a big-sized, well decorated booth in the same location in Hall 4.2. "Camco is exhibiting its complete line to capture visitor attention and underscore its image as a reliable one-stop shopping service provider," the president said. Camco president Bruce Liu believes that non-stop commitment to R&D, quality and services are the smart ways for Taiwanese suppliers to develop sustainably. One competitive advantage boosting that image is Camco's dedication to continuous R&D. "Through constant R&D, Camco can continuously expand its line to meet the ever-changing needs of customers," Liu emphasized. He added that the firm is also concentrating on communicating with customers during the R&D phase to develop truly marketable products. Liu also noted that consistent product quality is equally important in building trust in Camco's services. "We insist that all our products are manufactured in Taiwan and made with the strictest control measures conforming to international standards," said the president. "100% made-in-Taiwan is a strong appeal of our products to foreign buyers." Today, the company's products have been well received by overseas buyers, mostly from Europe, the U.S. and Japan. Facing the increasingly competitive global market, Liu believes that god helps those who help themselves. "Taiwanese auto parts suppliers are mostly small and medium in size. So, to develop sustainably, they must keep focusing on R&D, quality and value-added services, as well as maintaining organizational flexibility to help their customers profit and build up an image as irreplaceable suppliers."